Japanese Episode DP 147: "Satoshi and Hikari! A Tag Battle!!" American Episode 1242: "Bagged Then Tagged!" The time has come for Kotone and Kazunari to return to the Jouto region! Before saying goodbye to their new friends, our heroes make their way to a nearby coliseum to have one last tag battle. Before they can start, however, the Rocket-Dan appear and kidnap Pikachu and Potchama! The trio's mecha burrows underground and escapes, so our heroes split up to chase after it. Eventually, Kazunari is able to track the trio down and leads his friends to their location. There, the Rocket-Dan is blasted off and their stolen pokemon are retrieved. Later, Satoshi and his friends return to the stadium to start their tag battle. Satoshi and Hikari bring out their Moukazaru and Hinoarashi and Kotone and Kazunari bring out their Chicorita and Waninoko. The battle begins with neither side really appearing to have an upper hand. As time goes on, Kotone's and Kazunari's pokemon look like they're about to go down for the count, so the two trainers cheer their pokemon on in an effort to continue the battle. Much to everyone's surprise, Waninoko suddenly evolves into Alligates! 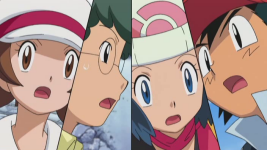 The battle continues, but Satoshi and Hikari manage to defeat their newly evolved opponent. Later, our heroes meet at the airport to see Kotone and Kazunari off. There, Kotone and Kazunari decide to become traveling companions. Before they leave, Kazunari's father gives the group a PokeGear and tells them that they'll be in touch. The blimp to the Jouto region takes off, and Satoshi and his friends continue on their journey through the Shin'ou region. Kotone and Kazunari are outta here. The walking, breathing HeartGold and SoulSilver advertisements make their departure in this episode. I'm not a huge fan of episodes where they cram two stories into one because it shows that the writers didn't have enough confidence in either story to allow it to carry a full episode. The tag battle portion, however, saved it. I think part of the reason I liked it - other than the fact that it was a genuinely good battle - is because it just made sense to me. It's perfectly in-character for these people to want to battle each other to say goodbye, and I honestly can't think of a better way to send these characters off. I did feel, however, that the Rocket-Dan story was the weak link here. I mean, did anyone else think that the solution to whether or not the Rocket-Dan went upstream or downstream was really really obvious? "Oh look, Kazunari just noticed a trail of pokemon awkwardly popping up along the river and decided to follow them. OMG HE IS AN ACE DETECTIVE." I can't talk about this episode without talking about how superb the animation is. Of course there's that famous scene where Moukazaru delivers the final blow to Alligates, but the rest of the episode looks just as amazing as well. The poses are great, the animation is smooth and powerful, and the colors in this episode are really vibrant and attention grabbing. I'm trying to think of an episode that looks better than this one, but I honestly can't think of any. It's that good. Also, for some reason, I've recently become obsessed with the fact that all the people in this show go from place to place by blimp. No matter how many times I see them, they still seem like a really, really ridiculous way to get around. But maybe that's the point. One thing about the dub I've noticed lately is how awful Brock's voice has been. I'm not sure when this started, but the character who once sounded pretty decent and had a pretty decent range now just sounds like he's pissed off all the time. I also wanted to mention that the cropping in this episode was really, really bad. Usually I'd post an image or two to show off a particularly poorly cropped scene, but the thing about this episode is that there are just too many examples of bad cropping that selecting a few is too difficult. Brock: "Hold on. First we should pay our respects." Originally, Takeshi told everyone that they should go pray. But since, y'know, prayer = religion and religion = taboo, the dub changed it. It's a decent alternative and gets across the same meaning, kind of, so I can't be too upset by it.